It is rare that a movie penetrates so deeply into your soul that it lingers within your senses long after you depart the theater. I move with such raw energy that it swallows you up, spits you out and leaves you alone to pick up the pieces and analyze the importance of what you witnessed. 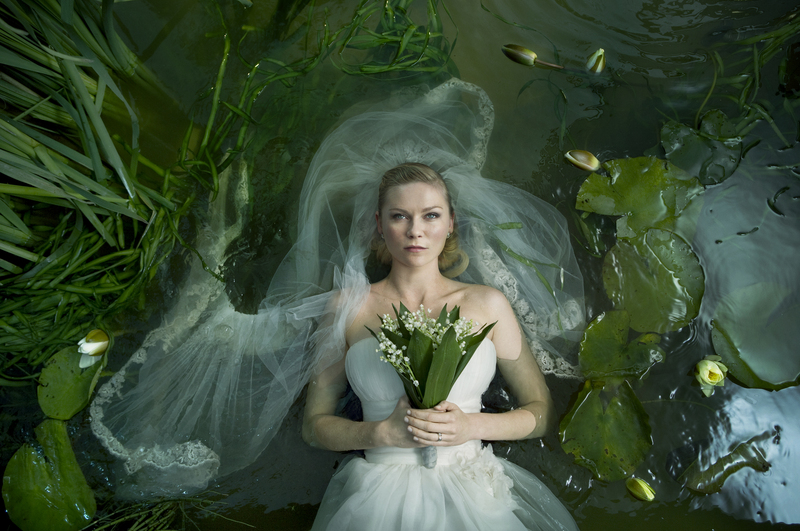 Melancholia, told in two parts, Justine and Clare to the score of Wagner’s Tristan and Isolde by Lars Von Trier is a film psychology opera wrapped in the backdrop of a science fiction story line. 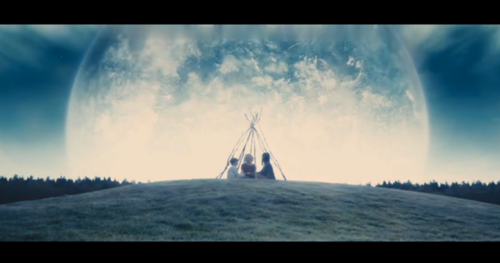 With poignant performances led by Kirsten Dunst and beautiful cinematography and hand held camera realism, Melancholia goes much further than the expectations of the audience. The movie opens with a subtle blend of humor, romance and character development that brings two families together for an extravagant wedding. Lavish in setting and cost, this union of two young lovers is wrought with the demons of family and the deeper bond between two sisters, one with a passion for life and happiness and the other with a struggle with extreme depression. The depression is so intense that it flirts with a mental illness and an inability to feel. The relationship of the two sisters becomes so critical to the story that as we grow closer to the stunning conclusion, their differences will collide and have the audience thinking much more closely about themselves. In it’s perfection, the movie is flawed. Soft and subtle scenes bring an artistic flavor while still maintaining that we are inherently damaged. 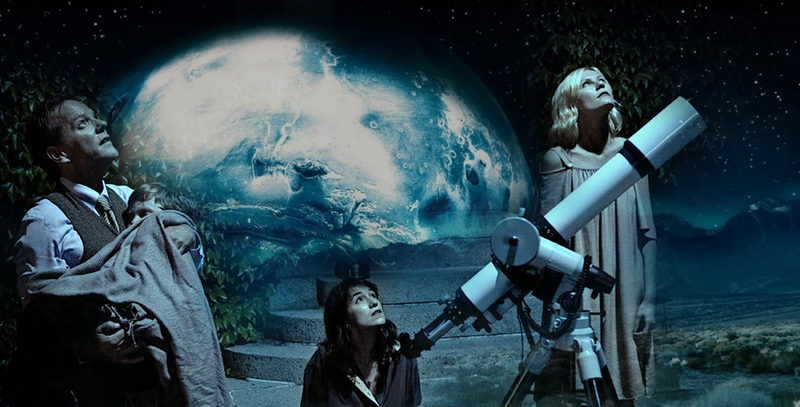 As Melancholia, the planet, comes closer to the Earth and this beautiful ball in the sky lights up the night like a strobe from Heaven, Justine makes a spiritual connection to the planet that is on a course for Earth. She lay naked on a rock at the edge of a stream absorbing its energy as she feels her soft silken skin warm in a celestial exchange. During this marriage, Clare witnesses this transfer with concern. This is a divided concern as part of her weeps for her sister’s condition while the other part is dreaded fear for the possible apocalypse. Justine’s illness heightens other senses. Through her emotional numbness she can become one with this planet staring down into our own mortality and sense the impending doom along with the stable horses whose unrest plays into the background of the second act. During one of Justine’s and Clare’s horse rides, the camera follows their journey as they race the path through the fog and create a metaphor of the struggle to emotional supremacy, each passing one another back and forth as they unconsciously deal with the expectation of this possible annihilation. The movie begins with the union of two young lovers who are about to embark on a new life together without any chance of success. Knowing the obstacles and challenges they must face, they took on this opportunity while both knew its inevitable failure. Acceptance of failure or denial of truth are two struggles and we are forced to decide a path. It is the path of acceptance vs. denial and fear that each of us faces in our own mortality. The end is not relevant as we will all face the final outcome. It is the choice we make in acceptance of possibility. Can we suspend reality and see beyond this life on earth? “We are alone” Justine tells Clare. Clare believes there is other life, but Justine is certain we are alone on this Earth and it is a short time we have on this Earth. There is such intense moments between Justine and Clare that manifest and grow as the movie progresses. Act one, we accept as an audience the flaws of the sisters. Act two, we begin to see how these flaws overwhelm and dictate the actions of the sisters. The key to this development is the isolation element presented. 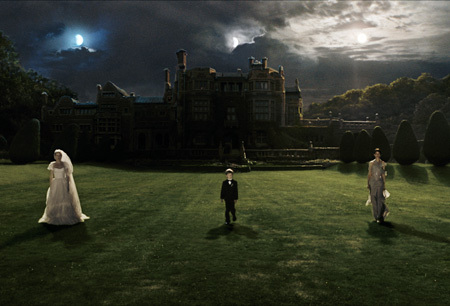 During a potential apocalypse, there are global ramifications, but this movie is set in a remote mansion overlooking the ocean with no outside forces to influence the actions of the main characters. It is this isolation that humanizes the setting, the dialogue and the actions. Fate is in our hands until the moment when we lose control. Gaining back that control is predicated on the ability to control emotion. Action is weakened by emotion. In the end, can we be jealous of the highly emotional sister who yearns for happiness and family or the emotionally stunted sister with an inability to feel any form of joy. For many, elements of both are within us. Maybe the sisters were in fact the creative mind of Von Trier who was able to take his own state of being and create two entirely different characters. 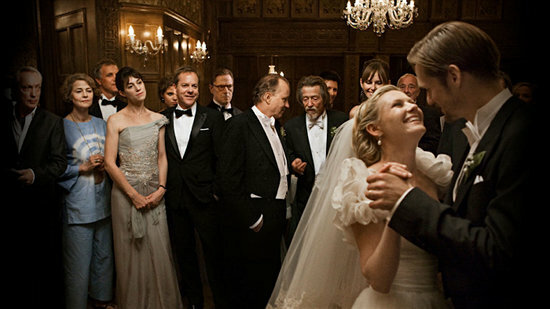 With a stunning use of still live shots, beautiful scenery, a wonderful story and characters that strip themselves to mental and physical nakedness, Melancholia is a memorable movie going experience that will shower your senses and leave you dripping for days.